If you blink, you’ll miss it. Olowalu is on the West Side of Maui, on the highway to Lahaina, and is barely even a village. The weather here is dry and sunny, the landscape is parched and rocky, but the nearby ocean offers liquid coolness. The contrast of Olowalu: dry, rocky landscape and soothing blue ocean. 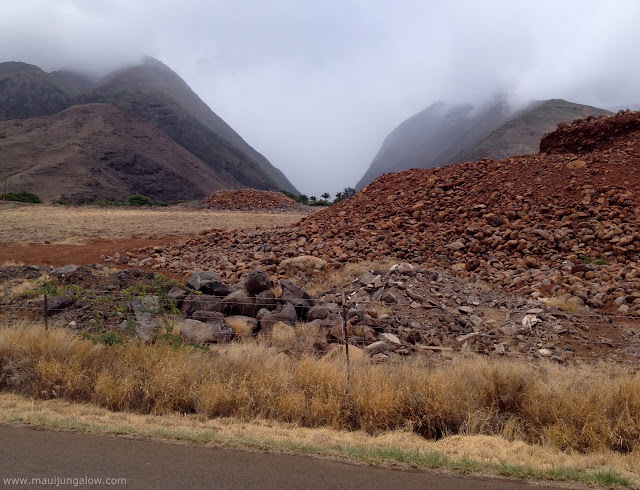 My husband jokes that the fields of Olowalu are where rocks grow on Maui. Luckily, two landmarks stand out on the inland (or mauka “towards the mountain”) side of the road: Leoda’s Kitchen and Pie Shop and the Olowalu General Store. Leoda’s has a homey ambiance and offers fresh baked bread, pies both savory and sweet, sandwiches and other comfort foods. Olowalu General Store has tasty looking provisions and helpful vacation items. Depending on the time of year, and other factors, there may be a fruit stand in the parking lot. Like personal pizzas, these are personal pies - one person portions - at Leoda's. This way, one doesn't feel guilt after eating the entire pie. Beyond food, Olowalu offers inexpensive camping, both tent sites and cabins by the beach. Beach camping is not that common on Maui, since it is either prohibited or allowed only with a permit at select locations. This rocky outcrop is dotted with petroglyphs. 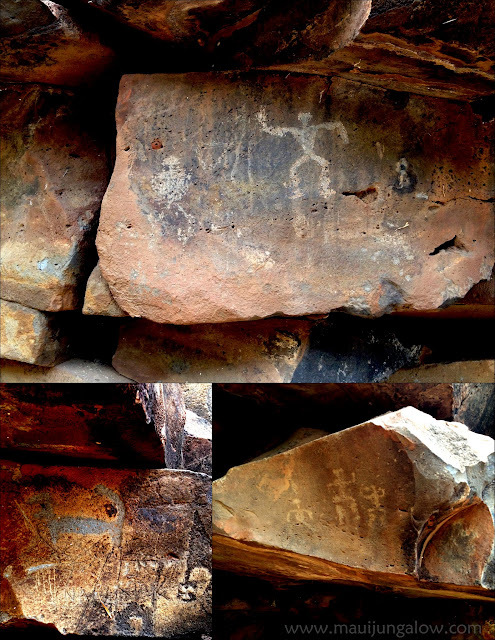 Petroglyphs are like cave art without the cave. They are simple designs etched or carved into rock surfaces, often by tribal or prehistoric cultures. Follow a nondescript dirt road behind the Olowalu General Store to an area with rocky hills and outcroppings. Look up and you’ll see a variety of ancient Hawaiian petroglyphs, quite visible to the naked eye. Even I can see them! If petroglyphs don’t hold your attention – because they don’t move, nearby Maui Paintball promises a lot of action and exercise. Going towards the ocean, away from petroglyphs and paintball, one may find the beach narrow and slender, rather than a wide, generous stretch of sand that welcomes the sunbather. Don’t judge the beach based on looks. 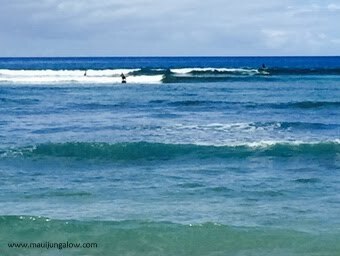 The Olowalu surf is ideal for beginners. The waves are gentle but consistent in their approach. This is where I had my first surf lesson and survived with no scrapes! Lastly, the waters of Olowalu are frequented by sea turtles. On a kayaking trip here, I snorkeled for what felt like hours gazing at several sea turtles at a “turtle cleaning station,” a location where small reef fish graze algae or tiny sea animals off the turtles’ shells. It was like visiting a turtle “day spa” under the sea. Sea turtle photo by my friend Carol Pratt. 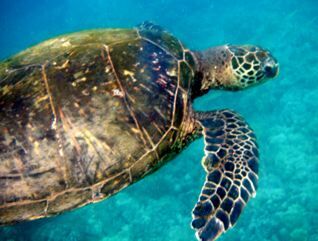 Sea turtles abound in Olowalu waters. The charms of Olowalu may not be readily visible but this little town - or townlet - is worth a stop. Vintage map of Maui showing Olowalu, with an alternate spelling of "Olawalu."